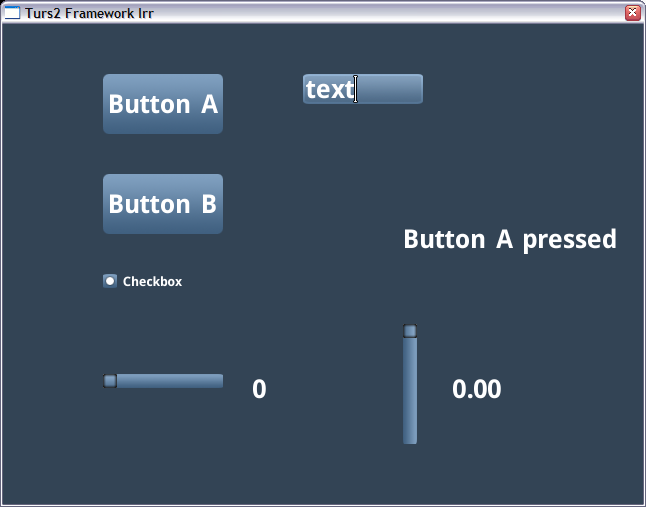 Turska is a compact and simple framework & UI component library. It is especially aimed for games which typically have only modest requirements for UI. The library is meant to be used in connection with some other library as a low-level platform abstraction/backend. Currently the library has built-in support for both Irrlicht (using D3D8/D3D9/OpenGL/OpenGLES), OpenGL (desktop 1.x), OpenGL ES (1.1) and SDL (using OpenGL). NOTE! The library is not actively developed anymore! Copyright © 2003-2012 Jetro Lauha. The library is dual-licensed with both new BSD-style license and LGPL. See the LICENSE-BSD.txt and LICENSE-LGPL.txt files in the turs2/doc/ project directory. Archive: Older project page in SourceForge of earlier Turska v0.x and v1.x development.